Since I was a child I always wanted to create universes and tell stories. I fell in love with the cinema at first sight and I grew up seeing all kinds of proposals, from the most important masters of the seventh art to the most extravagant B and Z movies. The democratization that was achieved with the arrival of the digital format encouraged me to take a risk and become a filmmaker. In 10 years of career I have made 8 feature films and more than 20 shorts and I hope I can do many more until it is humanly possible. As a child my favourite genre was terror and the zombie sub-genre always had a special feeling to me. 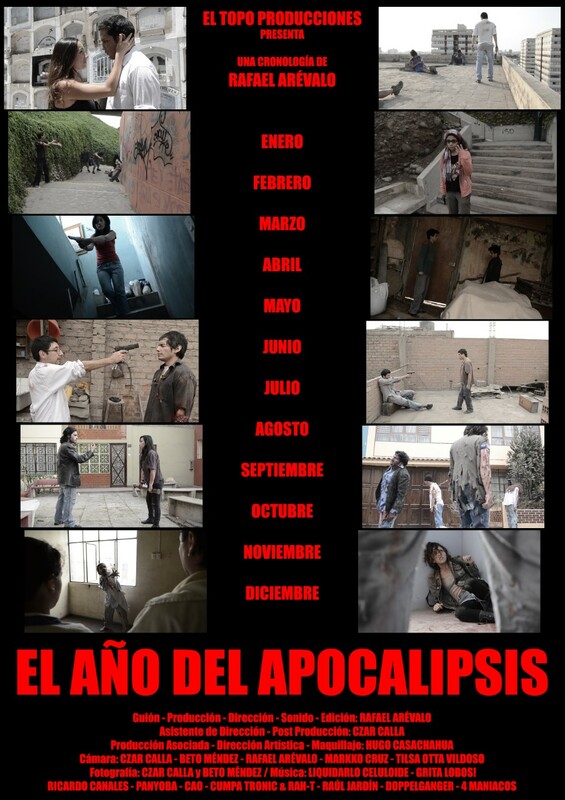 For several years I planned different options of possible films, but the excessive production of movies of the same theme that caused the revival of the genre since the beginning of the century, made me rethink everything and I decided to make a zombie anti-film that will tell several small stories with few dialogues and a lot of instrumental music from Peruvian independent bands during almost all their footage. My idea was to achieve a mixture of "Pink Floyd’s the wall" and the dead films of George Romero paying homage to the classic silent movies and the bizarre and trash movies. As my cinema is still very low budget I try to continue experimenting in all possible ways turning the flaws into effects until I can access a big budget that allows me to make a film at 100% of its possibilities. For the meantime, I have fun experimenting. We film the movie in different streets of the city of Lima without asking for any permission. We had to take advantage of days and hours when the areas we needed were empty and we had little time to record because, when neighbors or the police discovered us, we had to leave. Fortunately, we got enough shots to finish the movie with dignity. I have several new short films this 2018 and I hope to finish filming a new independent and experimental feature film before the end of the year. It is called "Sleepless Sleepwalker" and is about a poet who must undergo a sleep cure to enter into his subconscious and recover his first book of poems. In addition, I plan to post my sci fi feature film project "The Gospel of Chaos" to various contests and funds that allow me to direct it in the best way in the near future.